30. Carved walking stick, 1942. Object #30 is one of the first items received early in the history of the John Curtin Prime Ministerial Library, the carved walking stick given to John Curtin in 1942. The origins of the walking stick are not clear, and we don’t know who made it or who gave it to John Curtin. We do know that it was listed with items including books from Curtin’s personal library donated by Elsie Curtin to John Curtin House in Canberra, when it was opened as the headquarters of the Australian Labor Party (ALP) in 1974. Twenty years later the ALP thought it fitting that the books and walking stick should be incorporated into the JCPML collection being established at Curtin University. Curtin’s personal collection of books was accessioned as JCPML00001, his Hansard set donated by Edith Cowan University is JCPML00002, and the walking stick became JCPML00003. Walking sticks featuring snakes were popular designs for wood carvers in the 193os-1940s and a number may be found in Australian museum collections. The JCPML walking stick appears to have been made during Curtin’s first twelve months as Prime Minister, in or around 1942, with the year included in the design, together with the letters HPMJC for Hon Prime Minister Curtin, letters MAU (unknown), and the letters ALP, twice. The design of the carving, with the shaft entwined with two snakes is reminiscent of the Caduceus of Hermes. In some versions of the Greek myths, Hermes, winged messenger of the gods, used his staff or Caduceus to separate two fighting snakes, who were then in balanced harmony, entwining the staff as a symbol of peace. Perhaps the maker had this in mind by including references to the political ructions that occurred in the lead up to Curtin becoming Prime Minister. 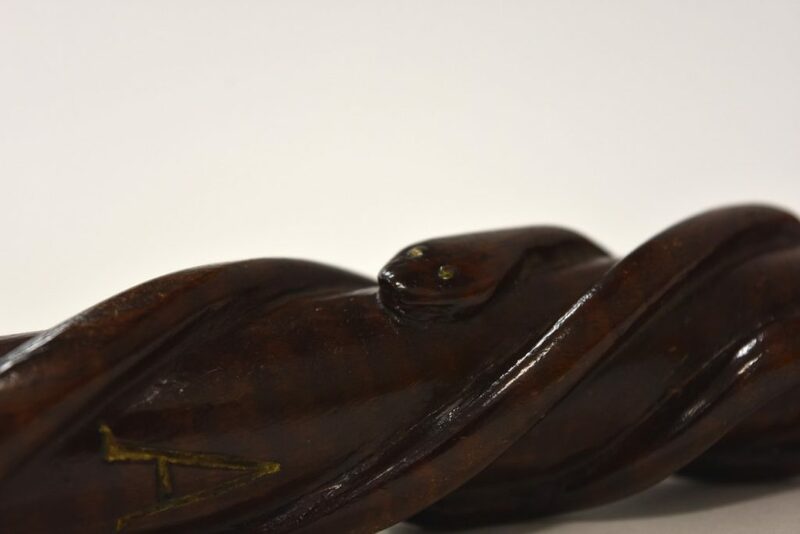 These beautifully carved twisting snakes have names – the letters UAP (for the United Australia Party) may be seen on one, and on the other UCP (the Country Party). The design is completed by the handle, the closed fist symbol of solidarity. Tyson, Stuart (1932). The Caduceus. Scientific Monthly, v34, no6, p495. I was very interested to read of the entwined walking stick. I have one on my wall and have often wondered what its origin was. There are 4 snake heads at the top and each twists around the stick but not overlapping. Each ends with a separate tail. At the top where the hand holds is a primitive bird……….no doubt waiting to catch and eat the snake although the beak is not adapted for that. I am assuming it was my Great Grandfather’s [1862-1944]as it has been in the family for some time. thought it might interest you. Previous Previous post: 29. Bust of Dr Thomas Logan Robertson, 1972.